I’m sure you’ve heard the expression, “It’s about the journey, not the destination”. I was recently asked to give a sort of “practical guide” on the logistics of the so-called four-course meal as most French families eat it. And that expression encapsulates what the French-style family four-course meal is all about. I wanted to really delve into the subject, as I am really excited that more and more people are interested in it. Forgive me, as this is a bear of a post with few pictures, but I hope you will enjoy the "journey" as it were, and will find some of it useful and practical for your family. My aim is to share my experience, and start a conversation... So I very much look forward to your feedback, comments and ideas on this. It appears more and more people in the United States are trying to adopt the French style of eating, given recent studies showing very low rate of child obesity in France compared to most other developed countries. Two very insightful books have triggered or increased this new found interest for the French take on food and kids’ food education: Bringing up Bébé by Pamela Druckerman, which touches on food but also talks more generally about the French take on child rearing. And French Kids Eat Everything by Karen Le Billon, an insightful and extensive analysis of the way the French approach food and food education for their children (the “éducation du goût", as the French call it, the “education of taste”, the very topic of this blog). Both books were very enlightening for me. As they both rightfully point out, the French aren’t very self-aware about their own practices. I was very much raised in the French tradition of the four-course family meal and have been eating this way since childhood without giving it much thought. Yet the way my mom instilled in me the love and appreciation of good food, the pleasure of cooking and savoring, the love of variety, is one of the things I cherish most about my childhood. Meals were always meaningful bonding times in our household. Dinner parties were festive occasions to connect with friends and share the pleasurable experience that is eating. Now that I have my own child, instilling that same “foodie spirit” has been a priority for me, and at a very young age. Exposing my son to as many foods (variety, textures, flavors) as possible before age 2 is one crucial component. The other crucial component is the family meal. Even though being a freelancer isn’t always easy, I am very fortunate to be able to work from home, and thus have, most of the time, three sit-down meals with my son every day, with the help of my wonderful mom who looks after Pablo when I work. And especially now that Pablo and we eat the same things, we thus eat as well as Pablo, and are on the same 3 meals plus one afternoon snack a day schedule. I really have seen the benefits of it myself as an adult. I don’t feel hungry throughout the day, very rarely snack, and eat a whole lot more vegetables than I did when I was a young childless adult with “looser” eating habits. So our family meals are composed of four courses, with 1/ a vegetable starter, 2/ a main course usually with protein and starch, 3/ simple lettuce salad and cheese, 4/ dessert. I tried to break it down in a practical way here. The four-course meal really only works if there isn’t too much snacking during the day. If the kids just snacked an hour before dinnertime or throughout the day, they may not be hungry to eat a full dinner, nor motivated to try new things. The four-course meal “paradigm” only works provided you come to the table hungry. The French don’t get panicky at the thought of their children being hungry. They have an expression that calls hunger a “bonne maladie” (a good illness). There’s nothing wrong with being a bit hungry and have the patience to wait for dinner time. So if you’re trying to establish the French style meal in your household, limiting snacks definitely is a necessary shift to be made as well. The other precondition for the four-course meal to not turn into a giant hassle, is that everyone eats what is served and on the table. There’s no cooking special dishes for different family members. Everyone has to taste. Of all the things being served, even a picky eater will like at least one thing (if you’re trying to get a child to try new things, I would try one new thing per meal, served with other known things the child enjoys). It is also important that everyone eat each course together. If someone is finished with the starter before the others, he can wait a few minutes, tell a story, talk about the flavor, smell, texture of the foods, for example. I have found that the main concern of most American moms I met was to get their kids to eat more vegetables. It seems to be taken for granted in the US that kids will innately dislike vegetables. Even my pediatrician was somewhat surprised that Pablo ate vegetables of all colors easily and thus didn’t need to take a vitamin supplement. The big advantage of eating this way, is that you get to eat the vegetables first, when you are most hungry. So after you fill up somewhat on vegetables, you’re more likely to have a smaller or more reasonable portion of the main course. When you get to the cheese, you’re almost done with dinner, and that small portion of dairy fat helps give you the satiety feeling to hold you over until the next meal. The simple taste of sweet at the end of the meal seems to be just a reminder that eating is, and should be, a pleasure. A very important benefit of the four-course meal is that it makes you pace yourself, and eating slowly (and chewing sufficiently) is key to portion control. A French doctor was telling me that when you eat slowly and really chew your food, your stomach shrinks and you need less food to feel full (more scientific information on this here). Plus it takes about 20 minutes for the brain to register that your stomach is full, so this way, you can really listen to your body's cues in terms of the quantity of food you eat. This is why French families end up eating less food in more time than other cultures, as you have to wait a little from one dish to the next. And by the time you get to dessert, you just have room for a taste of sweet, not two huge servings of cake. The other benefit of the four-course meal is to instill the art of anticipation. So much more positive than “patience”, isn’t it? You’re not “hungry”, you’re “in appetite”. You enjoy the actual process of the meal, rather than try to get it over with as soon as possible. I find that these are important lessons I want to teach my son, not just about food, but about life in general. Learn to enjoy anticipation. Take the time to be aware of your body and what it feels, learn delayed gratification. Here are the specifics of the four-course meal in our household. This is very convenient, as you can cook or steam vegetables ahead of time, and stick them in the fridge for the next 2-3 days. A couple of times a week, we cook (boil or steam) two or three vegetables, like green beans, potatoes, a whole cauliflower, leeks, artichokes, zucchini, asparagus (green or white). We put them in containers in the fridge for easy starters. We make a large batch of vinaigrette to last a few days (olive oil, red wine vinegar or lemon, salt, pepper, a dash of mustard). On busy nights, we just look in the fridge, and mix and match. Sometimes we will have only leeks with vinaigrette, other times, make a salad mixing a few different veggies. I always try to add some fresh herbs, whatever we have on hand (I’ve really appreciated growing my own for this purpose). Some of our favorites are watercress soup, sunchoke velouté, cream of celeriac or broccoli, carrot ginger soup… I am looking forward to experimenting more with hot soups this winter. Option #4 – Make it fun! One thing my mom did when I was a child, which added to the fun of the starter, was to put a couple of options on the table, so I felt like I could choose and sample, like a mini “buffet”. So we can have a cucumber salad in yogurt tarragon sauce, as well as a small bowl of radishes. Sometimes, we splurge with a few slices of saucisson (dry salami). For Pablo, since he’s about 8 months and eating finger foods, we put 2 or 3 veggies on his plate, say leeks, tomatoes, and hearts of palm. We’ve watched him really enjoy choosing and discerning the flavors. Sometimes, he’ll gobble up the tomatoes first, and sometimes, it’s the leeks. In the same spirit, a couple of friends in France told me one of their strategies was to do “veggie buffet night”. They put a bunch of vegetables in little bowls with toothpicks, with some healthy dips. It’s fun, a change of pace, and very festive. Dipping makes everything taste better, doesn't it? A great way to get kids excited about eating vegetables. Ours is usually composed of protein (meat, fish, tofu, legumes…) and a starch/grain or other vegetable. At night, we may choose a hearty soup (say with lentils, or beans) with bread as the main dish, preceded by a salad. Option #1 – The kind that cooks quickly. We pan-fry a lot of things, whether it is sole fillets, leg of lamb steaks, beef patties, which only take a few minutes to cook. We usually serve that with boiled potatoes (white, blue or sweet), rice, quinoa or vegetable pasta as starch. We cook the starch 20 Min before dinner, and then just keep it warm, then we prep the meat or fish to be cooked in the pan just before sitting down to eat the starter. We savor the starter, then take a little break to go cook the meat or fish, and serve it with the starch. Option #2 – The kind that takes a bit longer, like a roasted chicken, a casserole, a gratin, a roast, a stew. We prepare it about 1 hour before sitting down for dinner (most often, I do easy recipes taking about 15-20 Min to prep, and then 1 hr to simmer or so (such as the chicken Basquaise, roasted duck, Cornish game hens…) Dishes cooked in the crock pot are a great option as well. In that case, as we sit down with the starter, we may put the hot dish on the table to cool off a bit while we enjoy the starter, and then serve. The French usually enjoy a plain salad after the main course to help digestion. It’s not a mixed salad with lots of things in it, it is a plain lettuce salad with vinaigrette (I like to add a shallot and some fresh herbs to it). The lettuce can vary from butter lettuce, to delicious lamb’s lettuce (“mâche”, if you have a Whole Foods or Trader Joe’s near you, they sell it), endive, or any other kind of lettuce. We prepare this before the meal, and set it on the table (with the vinaigrette at the bottom, tossing it just before serving) so it’s ready to go. I know it feels strange to have salad after the meal, but you should try it some time, it really helps digestion and is a great palate cleanser. A small piece of cheese can be served with it or right after it. The fat in the cheese helps trigger the satiety feeling in the brain. Of course, I never knew that growing up, I just knew I really enjoyed concluding my meal with a piece of cheese! (Pablo seems to prefer that to dessert as well). On busy week nights, I rarely “cook” or make a dessert, that is mostly for special occasions. Dessert is most often a yogurt (can be cow, sheep or goat’s milk, regular or Greek Yogurt, often plain with just a sprinkle of sugar, or with fruit), or a piece of fruit. Simplicity is key. For sample meal ideas, check out some of Pablo's menus. So let me walk you through it. Let’s say tonight’s main course is one of my mother’s specialty, chicken Basquaise. We eat around 7pm. At 6pm, whoever is cooking starts the Basque chicken. Prep time is about 15 minutes. Cooking time about 50mn to 1 hr. By 6:20pm, the chicken is under way in the Dutch oven… and we can deal with bath time, picking up toys, etc. At 6:45pm, we start getting dinner ready. I open the fridge to see what vegetables we have. We cooked a cauliflower and some green beans yesterday. I toss together some cauliflower, green beans and cherry tomatoes, drizzle some vinaigrette. I grab some marinated olives too. I take a whiff of the chicken, because after all, life's all about smelling the roses dinner. A great way to be “mis en appétit” (literally, “put in appetite”). Anticipation is key to enjoyment. As Pablo walks (toddles rather) into the kitchen, we show him and have him smell the aromas. Dinner is going to be fun. It’s 7pm, time for dinner. The chicken is done, we set the hot Dutch oven on a table mat on the table. And we sit down. We enjoy our cold vegetable salad, Pablo loves asking for more olives. Then we put the smaller plates aside, and serve the chicken Basquaise. Everyone soaks up the juices in their plate with a bit of bread. We toss the salad, and whoever wants some can have some. I always try to give a few leaves to Pablo, he seems to really enjoy the tangy vinaigrette and chews on the leaves forever. That is, until the cheese is offered… for Frenchie Pablo does love his cheese! Everyone picks which cheese they want to try tonight. Then, (and technically, that is the first time of the meal I have to get up from the table), everyone chooses what they want for dessert (if they want one.) I bring a couple pieces of fruit, and some plain yogurt sprinkled with a bit of sugar. No choice is give on the main course, so it’s nice to have that little flexibility for dessert. Dinner usually takes about 45 minutes. Meal summary: about 10 different kinds of vegetables, some dairy, some protein, some starch/grain (bread in this case). And a happy family with full tummies! The important is to look at it as a moment of connection, relaxation, enjoyment, conversation and laughs. - I am a big fan of farmer’s markets. I try to go on the weekend and pick up whatever is local, organic and seasonal. It helps me compose the meal plan. Otherwise, we try to shop 2 or 3 times a week, so we cook the foods as fresh as possible. - Twice or three times a week, whenever we have time, we cook two or three vegetables to eat cold during the week. - Sunday night (or once a week) if possible, we make something that takes a bit longer (a hot soup or gazpacho, grated carrots), to cover a couple meals in the week. So... there you have it. Are you tempted to give it a try, or still skeptical? Share your thoughts in the comments! It is really interesting to see it explained. I really should try lettuce with vinaigrette on Cooper. He is pretty good with vegetables and fruit, but I have had very little success with salad. Haven't given him dressed salad though, just some plain salad in the side of his plate. Doing it this way might stand a better chance of him trying it. Would have to, as you say cut out his afternoon snack. Thanks for your comment, Jacqueline. Yes, the vinaigrette is key, Pablo seems to really like tangy acidic flavors, so it helps. I must admit I'm not too fond of plain lettuce myself :-) He has liked endives which surprised me as they are a bit bitter, but I think he enjoys the crunchiness. So if it's crunchy AND tangy, it works! I also give him a few leaves from my plate, which makes it that much more attractive ;-) As far as snacks, we do have one afternoon snack (usually fruit or something sweet) around 4:30 or 5pm, but not any other snack during the day. Helene, this is a very thoughtful and well written post. Typical moms in Japan take it seriously about cooking and feeding kids right as if cooking very nutritious meal is their job. There are some food that every kid refuse to eat, but most kids pretty much eat everything. I didn't think it's such a big deal about it until I came here and see the difference. It's easier when kids are eating at home right with homemade healthy well balanced meal made from very young age. It was interesting to see how the French has similar teaching in feeding food. Your instructions and tips are very helpful and I enjoyed your post! Hi Nami, thanks so much for the kind words, I was hoping it wasn't too long... I've always noticed how Japanese and French were kindred spirits in food, I'm not surprised it applies to kid's food education as well, I'd love to learn more about the Japanese way! I love this post, thanks for sharing! We don't have children yet, but are working to be mindful of the food culture we will one day pass to them. Thanks, again! I always enjoy your blog. Thanks for this post! I have read Karen LeBillon's book and my husband and I have been talking about implementing a French style but felt a bit overwhelmed about how to manage it. This helps a lot! We have a 2 year old who is a pretty good eater, adventurous when in the mood :). We missed that 0-2 window for introducing lots of new tastes, but we're doing our best to make up for lost time. Anyway, I was wondering, is there a typical French breakfast? What do you eat in the morning to make it from 7 until noon or so without a snack? We accomplish it on some days, but on others a 10 a.m. snack seems to be in order. Just curious. I agree. I read LeBillion's book but was really wanting to know how this works in practice and was wondering how you keep the main meal hot and do those courses without being up and down through the whole meal. This helps it all seem manageable and make so much sense. Thank you so much. I have found my new favorite blog. :) I love all the specifics. That's what I need! Wow so glad I found your blog! This post was very helpful and I am excited to implement the salad course! I don't give my son many raw veggies- he spits them out when I do usually and he has never actually swallowed lettuce but I am going to try! Thanks! Hi Sarika, thanks so much for coming by :-) I don't know how old your son is, but keep faith in the raw veggies! I don't give up until I've offered my son something at least 15 times (that actually has never happened, Pablo usually takes to the food after 3 or 4 tries if he wasn't too fond of it the first time). Also doing purees and soups of single vegetables before introducing them raw helps. I find raw vegetables were interesting to my son for texture (cucumber is a good example, endive as well). And a little vinaigrette makes everything taste better as well! Or I should say, it brings out the flavors. Another thing I did with the lettuce, is I let Pablo spit it out after chewing on it, to get him familiarized with it. Little by little, he stopped spitting it out and seems to like it fine now. I love what you describe as well, Shu Han, so "convivial" as the French would say, I think that's the key for kids. Being offered a variety of foods and the family meal/atmosphere are so crucial. 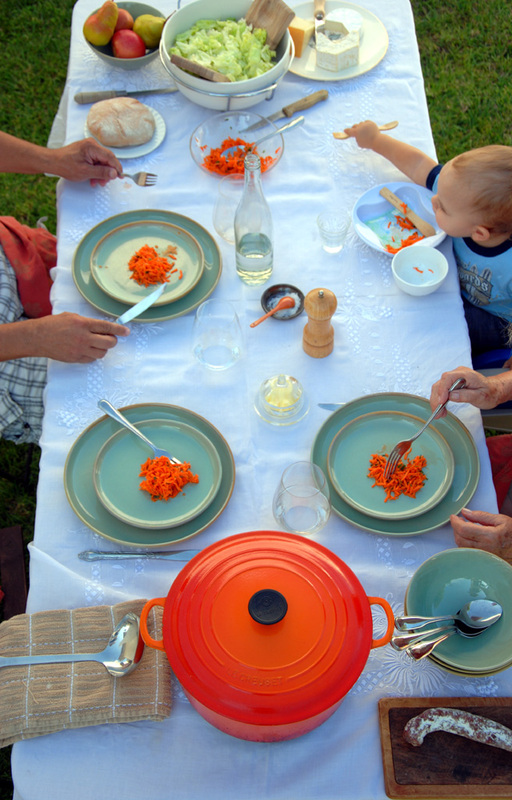 Such a fascinating topic, how different families eat around the world! I had another question- how does milk play into this schedule? I'm so excited to have just found your blog. Like many of your fans, I read Karen Le Billon (as well as Pamela Druckerman's Bringing Up Bebe) earlier this year. I happened to be pregnant with our first little one at the time, and couldn't wait to start "building the appetite" once she was born. Ines is now six months and we're trying all kinds of veggies, and yogurt, to start. It's really enjoyable to try new things with her. However, my husband and I are very lazy about dinners for us. Typically we each just prepare our own meal to our liking and eat together (although sometimes separately if we are busy finishing up work for the day). One factor for me is never being able to come up with good, hearty dinners that both of us will enjoy and that are quick to cook. Where do you get your ideas for main courses? You mentioned some of your mom's recipes - are these "in your head" or do you rely on any cookbooks for inspiration? If so, which ones? Do you have any other tips for fitting in cooking to a busy week? Again - Thank you for the brilliant guidance and I will definitely be relying on your blog for continued inspiration! Hi Lindsay, thank you so very much for the kind words! 6 months is such an exciting age when they're trying out so many new things! Enjoy your little Ines and her brand new taste buds! I completely understand your dilemma with trying to get ideas for dinner. Before we had our son, my husband and I would often have those evenings where we just didn't know what to make. Things started to shift for us when Pablo was about 12-14 months, because he started to eat more and more like us, and I decided that we would, most evenings, eat all together. So the easiest was to cook one meal for everyone... The family meal (planning it, cooking it, eating it) became a very fun part of our life, a way to connect as a family, and Pablo really picked up on that, and as a result, eating is a pleasure and a joy for the whole family, which is key. As far inspiration, it's a combination of sources: food blogs (check out my blog roll, lots of wonderful sources of recipes), some cook books I have (mostly French, some in English - I'll make a list of my favorites and post it soon), some recipes I improvise, and just dishes we've made for a long time. I try to share a lot of recipes from French cookbooks on the blog to make them more accessible, and I will make a better effort of putting the prep and cook times in the recipes. But I think the most helpful thing I started doing, was having a weekly meal plan. It remains flexible, and we go off it sometimes as we need to, but it takes away the stress of "what are we eating tonight? ", you can shop ahead of time and know you're eating a good variety of things. I would definitely give that a try, even for maybe one or two nights a week at first, and see how it works for you. Another thing I would recommend is CSA deliveries and/or farmer's markets, buying local (organic if possible) produce and coming up with recipes based on what you find, is a good way to eat fresh and seasonal... I post our menus every week, so you may want to browse through the menus for some ideas as well... You will see that most meals may sound "fancy" but are actually pretty easy, maybe 20-25 mn prep at the most. I hope this is helpful and somewhat answers your question! Keep me posted on how it goes for your family! Thank you! This is just what I needed to help me better construct my son's meals. But I have a question... where does a bottle of milk come into play here? My son gets full from his bottle of milk between breakfast and lunch in order to be hugnry for lunch! I would love to know what you do. Hi! By pleasant fate, I discovered your blog when you made a cameo appearance on Karen Le Billon's blog(great book btw). My jaw dropped when I read the foods you have prepared for your family...amazing(and yummy!)! For the past couple weeks, I've been introducing the new French way to my now 18 month old daughter and reintroducing this cuisine to my(kinda picky) six year old twin boys. So far, so good,especially with the boys(at least their tasting certain things)! Question 1: in regards to cheese: do you give your son the unprocessed kind of cheese? Or what age should you introduce a baby/toddler that kind of cheese? My daughter loves cheese, by the way. Question 2: I'm in awe of your garden!! I'm actually inspired to create on myself. However, my back yard is equivalent to Snow White's domain(squirrels, deer, rabbits, chipmunks, groundhogs, some birds). How to you deter them from your tasty yard? Hi, thanks for your great writing and sharing your ideas! I am starting solids with my 6 month old, who is my third... and hopefully will benefit from my more enlightened mothering haha! I have two older children(5 and 7), who are incredibly picky eaters - they have over-sensitive palates due to both being on the Autistic Spectrum. I usually avoid any conflict in an attempt to get SOMETHING into them, but every now and then I read something that inspires me to try new food again... and this is one of those moments! I feel tempted to start trying vege purees with them as if they were babies, and start all over again! At the present, one will eat bananas, and one eats apples. And that's IT for fruit and vegetables. So you can imagine I am rather desperate to make a breakthrough. Thanks again! I saw a post on Facebook from Laughing Lemon Pie (great blog!) about your blog and as a lover of France and a reader of Bringing up Bebe, I of course had to read this! Thanks so much for starting this blog and sharing the details of how to plan and implement a French meal - and one that obviously toddlers enjoy, too! I don't know about the 10 vegetables... wow! Although when I read through it, I didn't even notice there were so many, it just sounded so good. (I think my toddler may have an easier time of the veggies than I, come to think of it!) Thanks, again! I am SO happy that I found your blog, as I am just introducing new vegetables to my 6 1/2 month old daughter. I love the idea of the four-course meal for so many reasons (family time, your point about enjoying anticipation and teaching patience, filling up on vegetables first, good digestion and portion habits). I'm wondering when you started having one meal as a family, as well as how this affects your "night time routine" and Pablo's bedtime. Our Ella is going to bed at 7:30 now, but I think it's so important we have that family meal eventually. Thank you so much for your advice in advance! Hi Trish, glad you found it too, and found this post helpful. We really started the family dinner around 11-12 months, basically when Pablo started to eat much more like us (even though he still had some homemade purees here and there for a few more months as he transitioned into regular food). But we did start having breakfast and lunch at the same time as him probably around 8 months when he started on finger foods. Around 8-9 months is also when I started feeding solids at dinnertime. At that point, I would bathe him, feed him dinner around 7p and put him to bed around 8p, and we would have our dinner once he was in bed. Around 11-12 months, we started having dinner together earlier, around 6:45-7pm. Nighttime routine gets longer and longer of course as they become toddlers, so now (at 2) his bedtime is between 8 and 830p when all is said and done. The bath before dinner thing is apparently a French thing, I never questioned it until some American moms mentioned their surprise as they do the bath after dinner. Whatever works for each family, really, but I have found it nice to have the meal as the last relaxing "event" of the day for grown-ups too and not having to deal with bath etc afterwards (our nighttime routine focuses around books and songs). I guess it's a matter of juggling things around a bit until you find a schedule that works for your family. I hope this somewhat answers your question? Check out the FAQ section as well (tab at top right below the banner), you might find some additional useful information... (I will probably add your question to it too :-) Let me know how things go with your little one! I am Romanian and for special meals we also ate in courses, though not as formal and we could skip ahead to the next course based on whether we were done (rather than waiting for everyone) at times. This description made my mouth water! I would love to try it now and then, but I don't think I could do it regularly. I like the idea of precooked, cold veggie with vinaigrette. My children are average when it comes to 'picky' eating--nothing extreme. And they accept vegetables now and then (they are almost 2 and 3.5). Recently I introduced my daughter to eating an artichoke. I cook based on mine and my husband's preferences and don't go for 'kid food' except that I'll toss in something simple (bread, fruit) that they like when the meal is a little foreign to them. Kids are just so different. I have a friend with two boys with big appetites and they are only older than my kids by a year. Yet they have been hearty eaters even though their mom cooks all sorts of Mediterranean (vegan) food that many kids would not touch. When I cook similar things, my kids are not anywhere near as adventurous. Some kids just will try anything, while others are slower at accepting new foods. Hi Adina, and welcome! Absolutely, kids can be so different in their approach to food, all we can do is offer, expose, engage and trust! Hi Laura! Wow, reading the post aloud, that's an incredible compliment! I feel humbled! And I always love being husband-approved too :-) The cheese always gets them ;-) I look forward to hearing your feedback if you give the four course meal structure a try! Oh I love this soo much. I am not french but I appreciate the French culture and lifestyle so much! I was curious if you do this for lunch as well and what breakfast is like. When Paolo was eating purees when did you feed him and how did that change the structure of the meal? Hi Ashley! We do do this same structure for lunch, especially since my son isn't in school yet and I work from home (and lunch is generally quicker prep). Though when I will be packing a lunchbox for him, it'll follow the same structure. Breakfast for us is more free-style, with everything served at once (yogurt, toast, cereal, with a bit of fresh squeezed juice). Thank you for this wonderful post, Helene. Like some of the others here, I have been trying to eat in a more "French" style, and I have so appreciated your comments about delayed gratification, simplicity, and the basic four-course meal. I wondered if you could offer some tips about cheese. I'm not a huge dairy person—lots of dairy doesn't sit well with me, but a little is fine. In particular, I have never cared much for cheeses, especially very pungent ones. But I love the idea of cheese at the end of a meal (especially since it helps create a feeling of satiety), and I'd like to try being a little more adventurous with cheese. Right now, I'm eating Laughing Cow and Boursin cheeses, as they're fairly mild—but do you have any suggestions for cheeses that would help me broaden my horizons and slowly get used to stronger tastes? Second, I have been wondering what you eat your cheese with during dinner. Do you just have a piece of cheese by itself? Or eat with bread or crackers? Or a mixture of those options? Hi Katrina! What a great question, I admire your desire to be more adventurous with cheese, that's awesome! Just like for our little ones, I think if we keep giving certain foods a try, some can become an acquired taste. Have you tried goat gouda or goat brie? I don't know if you have a Trader Joe's near you, they have them there. Also maybe a stronger Swiss, like Comté or Gruyère. Gouda is worth a try, mild tasting, as well as Port Salut (cow). Also Petit Basque (sheep). See what textures you prefer too (more creamy or firmer?) If you like to spread it on bread, you could try fresh goat cheese. I would recommend trying cheeses from different milks (sheep, goat and cow), especially keeping in mind that sheep and goat dairy is typically easier to digest than cow's. We usually serve the cheese by itself, Pablo will look through our cheese tupperware and pick out a couple to taste. If we do have it with something, for a stronger cheese or a spreadable cheese like Boursin, we use good bread to go with it. Fantastic piece. I recently covered a four course lunch, with Patricia Wells, prepared from her latest cookbook The French Kitchen Cookbook. I love the blanks that you have filled in here, to the method behind the delicious madness. I will be sharing a link to this piece when I post my feature, within the next couple of days. Great job, here! I love this post! We tried our first four course dinner tonight, and it was a HUGE success! Your blog is so thorough, and I really appreciate that. I have a question about the picture above. Is your little one using wooden utensils? At 13 months we are hoping to introduce a plate and utensils to his mealtime. When did you introduce these? And did you do forks/spoons and plates/bowls at the same time? Do you have a recommendation for a type or brand? Any suggestion would be helpful! Thank you! How wonderful, Ashley! Thank you for letting me know! About the plate and ustensils, it is a gradual (patience-requiring) process. I started to introduce it around 12months, but it did take a couple of months for Pablo to get used to it and not just empty the plate out to look at it. Probably would be a good idea to introduce the plate without food in it first for a couple of weeks to get past the novelty factor, and then put the food in it (just a thought?) The spoon and fork (I have some wooden, some plastic of various brands) I put those on his table from probably 8-9 months, and his interest for them increased over time. He used them as teethers for some time. I think it's good to introduce them and let the child use them and practice at their pace with no pressure. Hope that answers your question! Helene I want to thank you so very much for sharing how the courses are orchestrated! You are so incredibly generous with advice and it is so refreshing in a culture that prefers keeping good cooking technique as "secrets"! You really need to turn all of this into a book I am very serious that many families would appreciate your insight ..to you it all may seem normal but North America needs you!!! I am sure you will do well as you are blessing so many! My son is now 3 and I followed the advice of the book Sprout Right and only gave mothers milk and vegetables and fruit until his first year ..then after one I introduced grains ..then everything fell apart I was so nervous about choking hazard foods and what to serve in finger form that I lost my way ..and then when he hit 2 years he started refusing everything and my world fell apart I became completely confuse frustrated and tired ..crackers and cheese became our normal ..thankfully I have just finished Karen Le Billons book and through her have found your blog and am now on my second week of a whole series of enjoyable meals completed and enjoyed as a family! My little Theofanis is still did difficult but I am on a new path ..thank you for your inspirational menus that will help our family to start enjoying food and life again! Growing up in the Caribbean, the 'house' salad was fresh cut up tomatoes, cucumbers and grated carrot tossed with fresh pounded garlic, salt and pepper. Fresh and delicious. I actually never had salad dressing till I came to the USA (in my early 20's). What is your definition of a "piece of fruit?" For dessert, is it alright to have yogurt with a small apple? This seems to work. Hi there, my apologies for the late reply. That sounds fine to me, it all depends on one's appetite. What I call a piece of fruit is basically one fruit, i.e. one apple, pear, orange, tangerine, kiwi, etc. or a handful of grapes, or other smaller fruits. Hello! I have a question: which one tends to be your largest course--or are they all about equal in size? Also, is it common to eat 4 course meals for lunch and dinner in France or is it only lunch or dinner (given that they tend to eat dinner much later)? The reason I ask is that lunch is said to be often the largest meal of the day while dinner tends to be light. But I'm not sure how to exactly recreate that! I also wanted to add that several people mentioned to me they thought the French ate late dinners, but that's really variable, and most French families eat dinner between 7 and 830pm (some feed the children first around 7, and then eat among adults around 830 when children are in bed). What works best for our family is dinner all together around 7p. I just wanted to share our experience: when we moved here our son was 5, he had no snacks in the mornings, as you do with your son. But at school here it is mandatory to eat a snack in the morning (as a matter of fact, the first day I didn't put any in his lunchbox, that was a problem). And they barely have half an hour to eat their lunch (that includes washing hands, etc...). A BIG difference from France, where they have 1 hour to eat at the school restaurant ! As a result (and also because he's used to eat slowly), my son didn't have time to eat a full three-course meal for lunch. So now his morning snack is what would be the lunch appetizer, then he has the main meal and dessert for lunch. And during the week-ends, vacations, etc...he never snacks in the morning. Anyway, thanks for that blog, and all the best in the future ! Thank you, Helene! Inspired by this blog post, my young family of four enjoyed our first "French-inspired" 4-course meal together this evening. It was divine! The entire family (my husband, our 3 year old and 5 year old, and myself) sat at the table enjoying our food for a full 45 minutes (Yes, we timed it). The food was simple (based on your suggestions), but the communal experience was extraordinary. The kids left the table with full bellies and happy faces. My son even said at the end of the meal, "I want a four-course meal for breakfast!". Although I did glance over at my husband at one point during the meal and caught him literally gagging over plain cooked peas seasoned with salt and pepper. (He admittedly has the palate of a four-year-old, and peas are clearly not his favorite). But he endured and appreciated the "slower pace" of the meal, in comparison to our usual 20-minute dinners. Thank you again for the wonderful inspiration and the sharing of your own family's experiences! I read both Druckerman's and LeBillon's books when my son was a newborn, and we had a blast incorporating the "French Method" in his meals. Again, thank you so much for sharing your journey with us. You have a new subscriber!! Hello! Thank you for your lovely blog. I just told me husband about this post and we are looking forward to serving our next dinner in courses. I have one question: If my child does not eat of one course, would you advise letting him move on to the next one? My son is an okay eater, but there is a lot of room to improve. Right now he will eat eagerly on some nights and not on others, though I can typically get him to eat most of what I serve him with some coaxing. From some of your other posts, I understand that you do not think it is good to nag children to eat? I can imagine my son on some nights barely touching the main course but then wanting to chow down on cheese and fruit (he would never turn down either of these two foods). What do you advise? He should try even a tiny bit from each course. After he tries he can move on. In our house we have a rule of 5 kid-size spoons for the 3yo and 10 spoons for the 4yo. If there's salad with the main course they should take at least a bite of it and then they can eat more of meat/potato/whatever is there. THANK YOU THANK YOU THANK YOU for this post! I recently read "Bringing Up Bebe" have been so interested in this method of eating, but felt completely clueless on the logistics of it all! I was picturing a mother having to get up four times a meal and serve plated dishes to her family every 10 minutes. There are so many resources on WHY serving meals in courses is beneficial, but so few articles on HOW it is done in practice. I can't thank you enough for this post, and I'm so excited to try it! Thank you for your kind words, I'm so glad you found the post useful! Happy eating in courses :-) Let me know how it goes! Love your blog! Totally following what you do for my little one. One question, eating dinner at 7pm, what time does your baby go to bed? My baby just turned 6 months. I put her to bed at 9pm...people tell me that is late and that 7:30 should be bed time. Your thoughts? I also have dinner around 7pm, so bed time is just naturally later. Thanks so much! Find out how 1,000's of people like YOU are making a LIVING online and are fulfilling their dreams TODAY. This is SO well-written. It's one thing to see it talked about (liked in Karen's book), but quite another to see timing and how you go about prepping the meal. That's always my main worry, is enough time to create something this good! Thanks so much for posting this for us! Thank you so much for your kind words, Daniella :-) I'm glad you found this useful! Amazing Diet Plan.. Thanks for sharing. Love this post. Would love an updated version of your current meal plan / strategy now that Pablo is older. I have just found your page and really enjoyed reading it - thank you. Since reading FrenchChildren Don't Throw Food, I've been working on a more French style of eating with my 2 year old son and it feels like a great way to go. My question is about trying things. He is very reluctant even to try one mouthful often and I've realised he's quite set on certain foods he knows well. How much should you push it? I say he only needs to taste it and then we can go onto the next course and chat to him about the flavours and colours etc but it does sometimes involve tears and quite emotional protestations before he will try. This doesn't feel right - not exactly instilling a joy of trying new things! Any tips?